To Love a Rose: Remember: Don't Forget the Good Stuff! Remember: Don't Forget the Good Stuff! 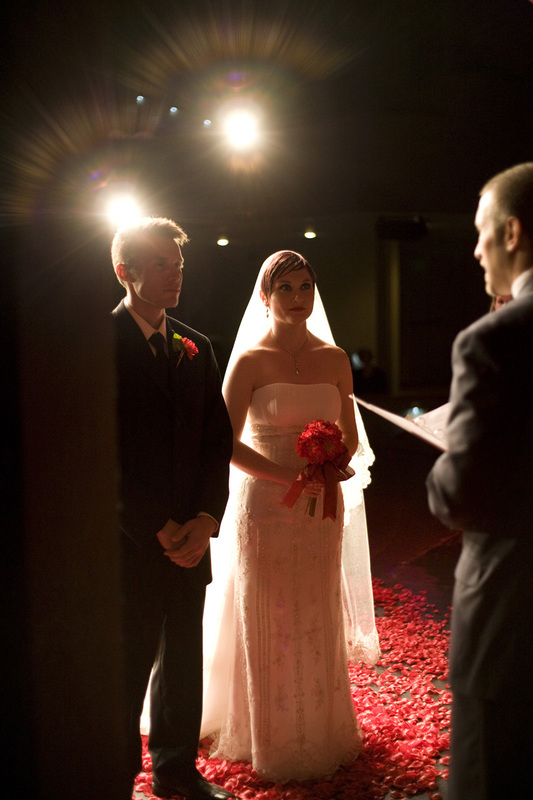 Mr. C and I getting ready to say our vows on October 18, 2008. I have been meaning to post this blog for the past several days, but we've been (and still are) shooting videos for the band. So, needless to say, life's been hectic (but good). Recently, I had an opportunity to send some of Mr. C and my wedding pictures to one of my favorite bloggers, Shari of Spearmint Baby! She has a few sister sites connected with this fabulous blog now - one on decor and one on weddings. When I got the e-mail from Shari saying she was going to feature our pictures, I was sitting at our favorite sushi place with Mr. C; and I realized then that I have been forgetting the most important part of this life journey: I have been forgetting to NOT forget the good stuff! I have so much to be thankful for and so much to be happy about. I have a fabulous marriage to a man I adore, my band is finally getting to move forward on several projects we've had to put off due to health reasons of one of my sisters/bandmates, we just built a new house and will soon be moving in, my mom just celebrated over a year being cancer-free, and the list goes on and on! When you're caught up in a life-changing (and heart-wrenching) issue like infertility (and looking into adoption from any stand-point whether infertility is involved or not), you tend to get wrapped up in it, but not wrapped up like a friendly, warm blanket - oh no, more like smothered in it, drowning in it. Surviving the hurt and struggle becomes your number one priority, but I think I'm realizing more and more that the truly enlightened way to look at it would be to be forever grateful for the time and things you are given before the situation rights itself according to God's plan or fate or whatever you want to call it. For Mr. C and myself, I came to the conclusion right there that very night when I received that e-mail from the Spearmint Blogger that I should be grateful for little, spontaneous, late-night sushi runs with my husband. I should be grateful for every moment I get to spend with him, but especially these moments alone as a couple; because this goal we are struggling toward (parenthood - in whatever way we get there) will change that dynamic forever. We will no longer be Mr. and Mrs. C, but three (or more, as time passes). Even for all of the desire to be a mother, I am somewhat sad about the loss of the "us" factor. I like being Mr. C's world, and I like that he's my world; but a child will change everything. While I'm sure this change will be for the better, I'm going to take my time and be more selfish about things now. I'm going to savor these small moments before they are gone forever. Well, once again, I have no time left; and I must wrap up this blog. But, if you'd like to see some pictures of our special day just visit Spearmint Weddings!